Locals Rebecca Taylor, Doug Keil, Mary Ann Linderman and Jonathan Jansen tap paddles at the end of a match. Pickleball is said to be the fastest growing new sport in America. Why? 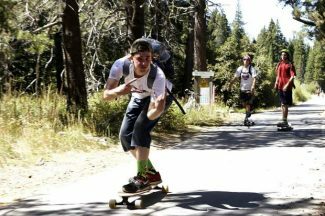 Because it’s fun for all ages, and for all fitness levels. Pickleball is easy to learn, but difficult to master. It’s harder than it looks. For experienced players, it is a fast-paced, competitive game providing a pretty good workout. It is easier on the knees and shoulders than tennis and it improves your hand-eye coordination. Pickleball combines elements of tennis, ping pong and badminton. It is played with a short-handled paddle and a plastic ball on a court resembling a scaled-down tennis court. Four pickleball courts fit on one tennis court so there can be as many as 16 pickle ball players per tennis court. 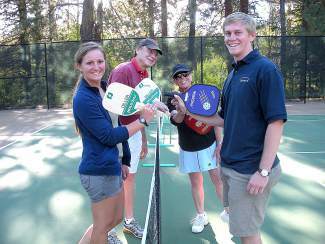 Come try the fun game with the silly name at the Incline Village Tennis Center during drop-in group pickleball on Tuesdays (4-6 p.m.) and Sundays (noon-2 p.m.). You don’t need a partner or a foursome and equipment and basic instruction will be provided for beginners. Just check-in at the Tennis Center and wear court shoes, a hat or visor, and sunscreen. • Dinking rules, slamming is for fools. • Hit at the feet, you will defeat. • Hit in-between, split the team. • Keep it low, steal the show. 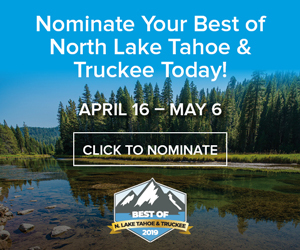 “Tip of the week” is a weekly feature running in the North Lake Tahoe Bonanza, in partnership with the Incline Village General Improvement District, providing locals with various tips pertaining to the recreation opportunities and services the district provides. This tip was provided by Bev Keil, Incline Resident and Community Pickleball Ambassador. Visit InclineRecreation.com/tennis or call 775-832-1235 for more information about Tennis Center membership passes, and a variety of programs and socials for both kids and adults.